We’ve done three virtual races to date for Fleet Feet Sports Raleigh, but this fourth one is the coolest by far… we’re a-shivering with anticipation! Starting September 23, racers will be able to log miles run near home and bound ahead on a 123 mile virtual route, while virtually visiting Irish castles and graveyards. The race will end with a costumed group run in Raleigh on October 26. The 123 mile Google route for the Spooktacular virtual race. Along the way, runners will get lots of chances to see spooky 360-degree Google Street Views when they log miles. 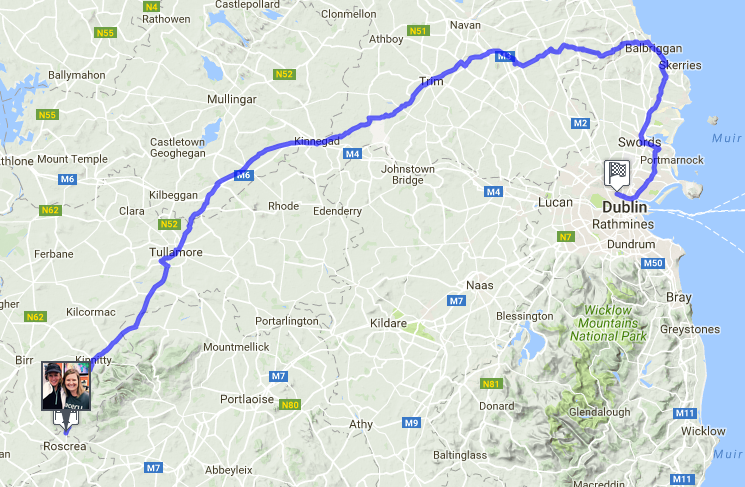 They’ll be passing places like Leap Castle, Charleville Castle, and Glasnevin Cemetery Main Gate. Racers also get cool and very shareable digital bibs. We worked with Fleet Feet Sports Raliegh’s sales and marketing manager Sharon Kyner to customize a virtual race route that would be particularly entertaining for her customers. Sharon has been particularly innovative in creating routes that excite her customers, both old and new. Fleet Feet will have die-cast medals for the first 100 participants. And, in a genius move to stimulate customer visits to the store, anyone who visits a store can pick up a coupon that cuts the race fee from $25 to $15. Fleet Feet Raleigh, which has stores in Raleigh, Durham and Morrisville, is promoting the race on Facebook, Twitter, Instagram and its own running news feed.